Clansman was developed by SRDE in the 1970s, to satisfy a General Staff Requirement (GSR) laid down in 1965. 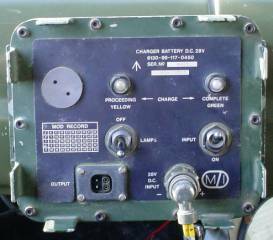 Built by Racal, MEL and Plessey, Clansman represented a considerable advance over existing radios being offered to the Armed Forces at the time. 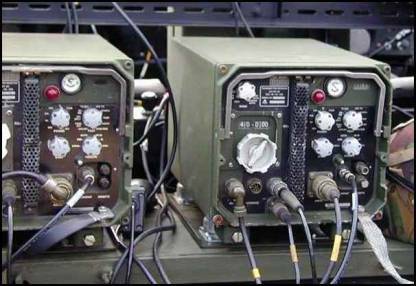 It replaced the aging Larkspur radio system, and proved to be more flexible, reliable and far lighter. The technological advances achieved in the design of Clansman allowed the introduction of Single SideBand (SSB) operation and NarrowBand Frequency Modulation (NBFM) to field-level communications for the first time. 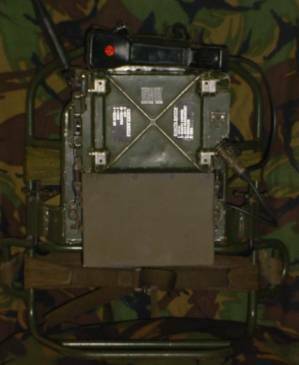 The Clansman family consists of nine main radio units, three of which are carried on vehicles, the other six on the back, across the chest, or other such places on a foot soldier. 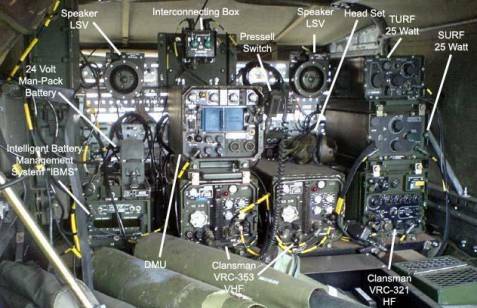 Models are designated "UK/PRC" or "UK/VRC", which stand for "United Kingdom / Personal Radio Communications" and "United Kingdom / Vehicle Radio Communications" respectively. 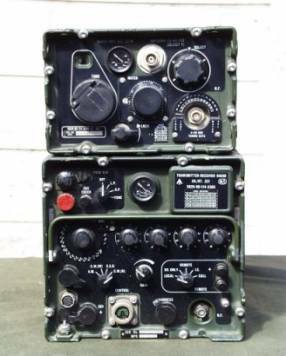 UK/PRC 319 - Special Forces and STA Patrol man-portable, patrol level radio HF / VHF, Half-duplex transceiver, which was built in the United Kingdom by MEL. 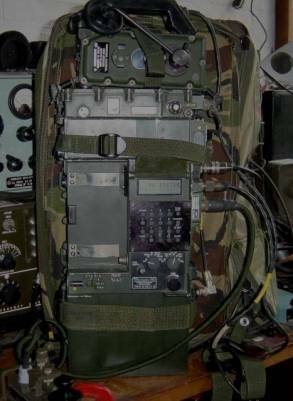 Features include key-pad entry of frequency, mode and data with digital LCD display; 10 pairs of pre-programmable channels; half-duplex operation with the option of transmitting and receiving on different channels; the option of using a removable pocket sized electronic message unit (EMU) to transmit and receive short data communications; fully automatic antenna tuner which can be remoted up to 50m from the set using standard co-ax cable; Self test facility. power output is 50 watts PEP on high power setting with an adjustable low power of 2-5 watts. Frequency range is 1.5-40 MHz allowing short range VHF communications overlap with the other clansman series radios on the higher frequencies. UK/PRC 349 - An intra-section level portable VHF FM transceiver. Built by Racal BCC. RF power output is 0.25 watts. 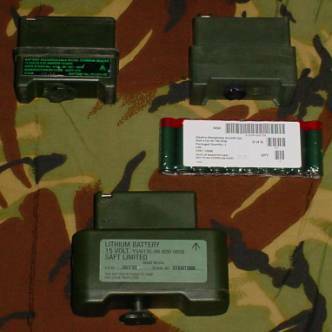 Units supplied to the British Army operate in the 37 - 46.975 MHz range, voice (FM) transmission Mode. 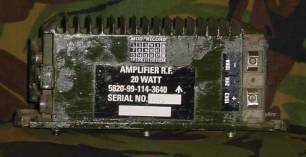 A high power (2 Watts) output version was also available and any 10 MHz block in the range 30 - 76 MHz could be supplied. 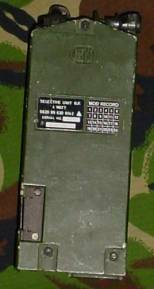 The PRC349 was added to the Clansman family in 1972. The first option is a 12 volt nickel cadmium rechargeable battery NSN 6140-99-661-4865 gives an operational life of 12-18 hours per charge, and is charged by "Adaptor, Charger DC 12V" NSN 6130-99-132-0688. 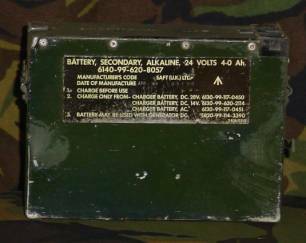 The second option is a 15 volt battery cassette NSN 6150-99-657-5246 which is loaded with ten "AA" size Alkaline Manganese Dioxide cells NSN 6135-99-195-6708 giving an operational life of 18-24 hours. The third option is a 15 volt Lithium disposable battery NSN 6135-99-920-0926 which gives an operaional life of 24-30 hours. 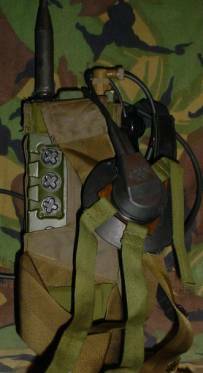 UK/PRC 351/352 - An intra-platoon level backpack VHF FM transceiver. Built by Racal. The PRC 351 has 4 watt RF power output, and operates in 30-75.975 MHz range with possible 1840 channels. 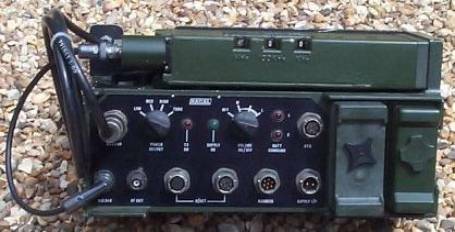 A SURF (Selector Unit Radio Frequency) can be fitted to the UK/PRC 351 & 352 (but only use low power on the 352) to prevent interference with other nearby HF sets. It manually filters out the unused frequency bands by use of a control on the front of the unit, so that only the frequency in use, and those close to it, are processed by the antenna. 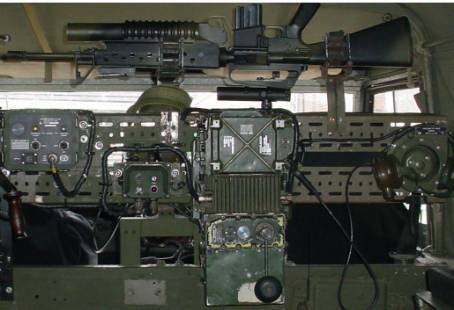 This radio is also capable of being mounted on a vehicle in conjunction with the TUAAM. The UK/PRC 351 weighs 7.5kg. The UK/PRC 352 is identical, with the addition of a 20 watt RF amplifier and can be used as a ground station, normally used with a ground-mounted antenna. The antenna gives the station a range of about 16km to a similar station. The UK/PRC 352 weighs 9kg. 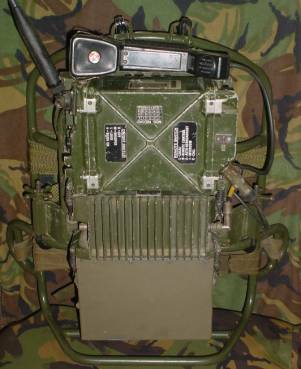 UK/VRC 353 - A vehicle-mounted VHF FM transceiver built by Marconi Space and Defence Systems. The frequency range was the same as the 351/352 with power settings up to 50 W. Antenna systems are provided to provide improved performance in semi-static situations such as an elevated broadband vertical dipole mounted on an 8 metre mast. The VRC is also capable of data transmission and when used in conjunction with an add-on unit (Digital Master Unit)provides a medium level secure speech network. UK/PRC 320 - An intra-company level HF/USB/AM/CW transceiver. Built by Plessey. Operates in 2-29.9999 MHz range with possible 280,000 channels. RF power output is a selectable 3 or 30 watts. The PRC 320 can be used as a backpack or vehicular radio with a number of different antennas available for different circumstances and needs. It can also be used as a ground station with a dipole antenna attached to two masts for long-range communication (with the bounce effect of the ionosphere giving world-wide communication given optimum frequency and time of day). The PRC320 features a built-in TURF (Tuning Unit Radio Frequency) unit for tuning the radio to the attached antenna. 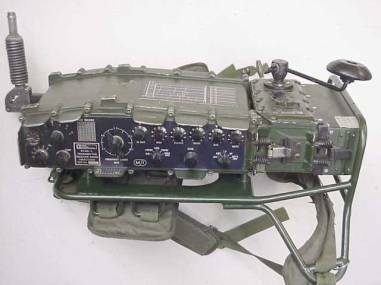 UK/VRC 321 A vehicle-borne High Frequency transmitter/receiver used for inter company communications outside of the normal working range of the VHF forward area nets, and for rear link communications to Brigade level. The VRC321 can be linked, using standard Coaxial cables, to SURF (Selector Unit Radio Frequency), to avoid interference with other HF Radios nearby; and TURF (Tuning Unit Radio Frequency), to tune the radio to the attached antenna. Modes of operation are USB/AM/CW. RF output 20 - 30 Watts. Manufactured by MEL, Crawley, Sussex. UK/VRC 322 A VRC321 station with an additional 300 Watt pep linear amplifier (ARF 250W) and appropriate high power antenna tuning unit (TURF 250). Manufactured by MEL, Crawley, Sussex. �	IBRU - Used in conjunction with the "Harness" point on VRC 353 and VRC 321 units, to operate 2 or more sets as a Rebro. (ReBroadcast). Re-Broadcasting allows 2+ networks, on different frequencies, to be combined, effectively increasing the ground size of the net. For instance, a vehicle using whip antennas may only be able to communicate 30km; though placing a Rebro vehicle 30km away could extend this to 60km by re-broadcasting the signal on a second net. �	DMU - A DMU, Digital Master Unit, used in conjunction with the necessary encryption devices, can provide secure communications on a VHF network, to other sets connected to a DMU. �	SURF - A SURF (Selector Unit Radio Frequency) is used to prevent interference with other nearby HF sets. It filters out the unused frequency bands by use of a manual control on the front of the unit, so that only the frequency in use, and those close to it, are processed by the TURF and the antenna. �	TURF - A TURF (Tuning Unit Radio Frequency) is used to artificially lengthen the antenna, as often HF wavelengths are too long to be used with vehicle whips, or even vertical radiators suspended from 8 or 12 metre masts. Using a larger antenna, such as the various dipole antennas, is not tactical when communicating in a warzone, as they take much longer to set up and are visible from a long distance away. Furthermore, getting the antenna to exactly the right length is still very difficult. A TURF unit can be used both to artificially lengthen shorter antennas, and fine tune all HF antennas to exactly match the frequency in use. 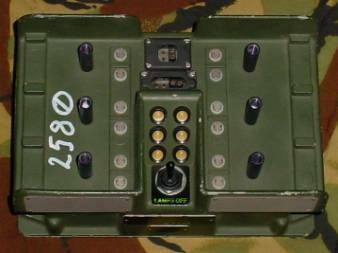 TURF units are considered mandatory when using 321 sets, and thus are built into PRC 320 sets as standard. They are not built into VRC 321 sets, as when a coax cable cannot be connected directly to the antenna (example - whilst using a sloping wire or vertical radiator), the TURF needs to be attached directly to the antenna, and thus removed from the vehicle. The TURF requires users to manually tune the antenna, unlike the VHF "TUAAM" which is self tuning.